I was born in 1966 in a small town in southern Germany, just in time to have some original memories of the Apollo Lunar Program. I have a hazy recollection of a TV picture showing a LM rotating in the blackness of space. And I quite clearly remember some live pans from the Apollo 17 LRV camera. As for many others, the TV coverage seems to have been a catalyst of my passion for the space program. Ever since then, I have followed every space event carefully, as is reflected in a collection of newspaper clippings dating back to that December of the year 1972. 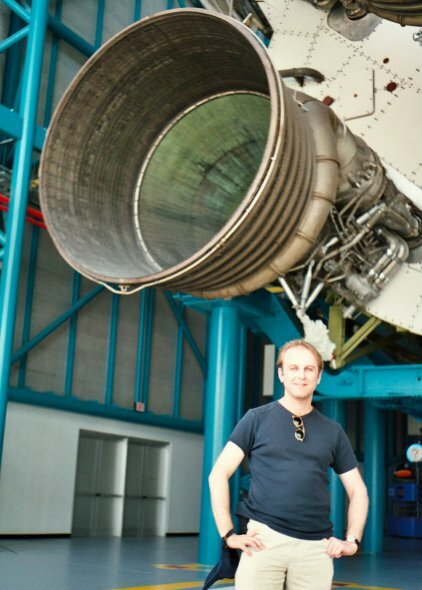 I have not managed (yet) to join a space program, but I have an interesting job with a jet engine manufacturer, am happily married and currently live in Berlin, Germany. The photo was taken at KSC in 2002.